PETALING JAYA, 8 December, 2017 - Sime Darby Auto Connexion (SDAC), the sole distributor for Ford in Malaysia debuts its first chatbot in beta along with multiple language support on its website, www.sdacford.com.my! This initiative is part of SDAC’s continuous efforts to engage with their customers with a friendly, quick and easy approach. “We want to be relevant to our customers and we are certain that this approach to engage with our customers adds value to our service to go another step further,” said Syed Ahmad Muzri Syed Faiz, Managing Director, Sime Darby Auto Connexion. We are proud to bring our first chatbot to life to assist our customers when and where it’s personally convenient to them, setting the stage for a new customer experience to obtain information about vehicles, services, assistance, and other matters, quickly. Currently, the chatbot is only available in English and it is able to provide customers with a convenient and conversational interface, enabling customers to start a simple conversation and the bot providing quick answers to frequently asked questions. For example, customers can ask the chatbot “Where is the nearest service centre?”, “What is the number to call for assistance?” or “What is the price of the Ford Ranger XLT?”, and receive an easy-to-understand response. In addition to the launch of the chatbot, SDAC has made its website (www.sdacford.com.my) multilingual. It is now supported in Bahasa Malaysia and Simplified Chinese to complement its existing English website for the convenience of customers who would be more comfortable browsing in their preferred language. 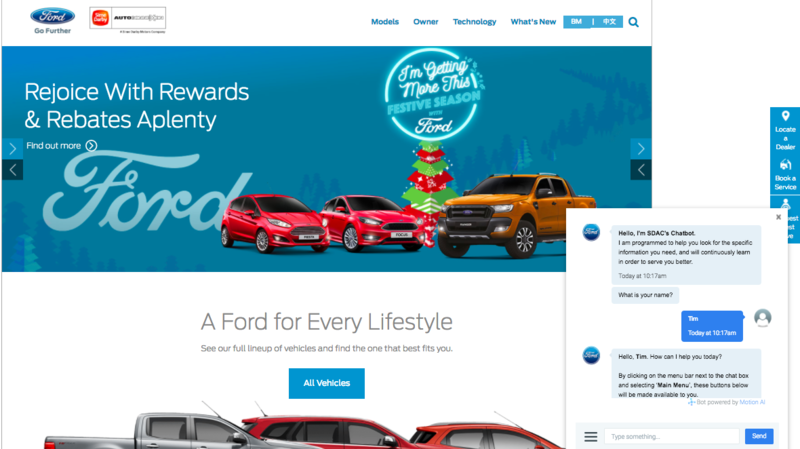 “We are proud to be the first automotive website to feature multiple languages as an option for us to engage and connect more effectively with our customers online,” he added. Visitors on the website can stay informed with the latest car models, news and announcements. They will also be able to book a test drive, book a service appointment, and more on the website. Head on over to www.sdacford.com.my to start a conversation with our chatbot and check out what’s new!